Five years have passed since young lovers Aeden ap Owen and Tess, Lady of Bridswell, parted—ripped apart by Tess’s mother. Now they are reunited in a twist of fate that could bring ruin upon both their families, far worse than the illicit love they shared in the past. Sent north by the Plantagenet king to investigate rumors of treason and dispatch the troublemakers, Aedan discovers someone is murdering monks and stealing saints’ relics. And all clues point to the Earl of Carlisle. But Tess is present, posing yet another problem for Aedan—her uncle has promised her to Carlisle, a man she despises—and she has agreed. Aedan must discover what sway forces her to marry a man she loathes—and learn the desperate secret she hides at all costs. A would-be usurper to the throne uses the stolen relics to amplify his power, wielding it like a weapon against his king, his country—and anyone who seeks to thwart his ambition. Meeting the traitor's black magic with magic of his own will prevent war, but will it also destroy Aedan’s chance to protect Tess and their last chance at lost love? The evil at work is strong, and in the final climax of his battle against the dark forces, Aedan must make a choice between the two people who are dearest to him. 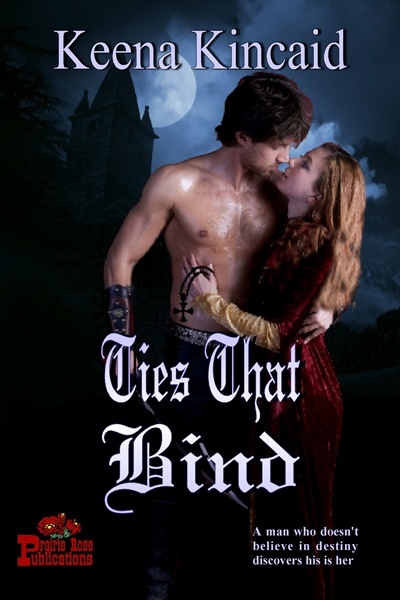 There are some things even his Sidhe gifts can’t change—but ties that bind are forever. Jasper scratched at the stubby remainder of his ear. Why would a saint no’ go to dust like the rest o’ Adam’s spawn? With a shrug, he dismissed the question and reached for the gold and coins at his feet. The man’s smile would frost the sun. Turning away, Jasper reset the slab, although only the blind wouldn’t know the saint’s grave had been disturbed. “There is no saint in Carl—” Jasper stopped himself.